The Vintage Bazaar is not the best shopping experience for play-it-safe-with-beige people. (On second thought, maybe I just ignored all the safe, neutral stuff!) It’s chock full of fun and colorful treasures. I didn’t have a lot of time for shopping, but I did grab a few snapshots. My dining room chairs are this exact style, but I never thought of doing this with them. Adding slatted seats has got to be easier than messing with new upholstery. Green Siamese dining room chairs forever joined at the seat. 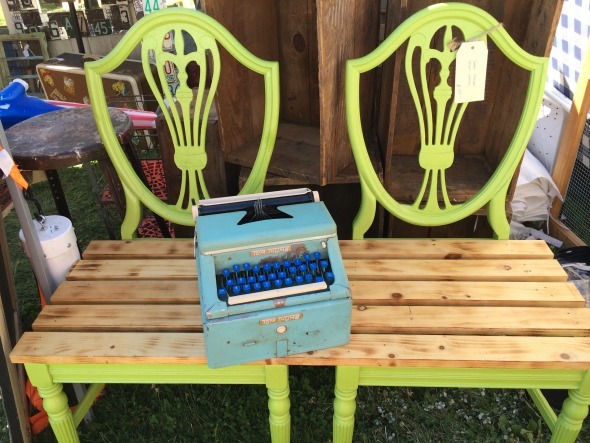 And what a cool Tom Thumb typewriter! The thrifting universe is a strange place. 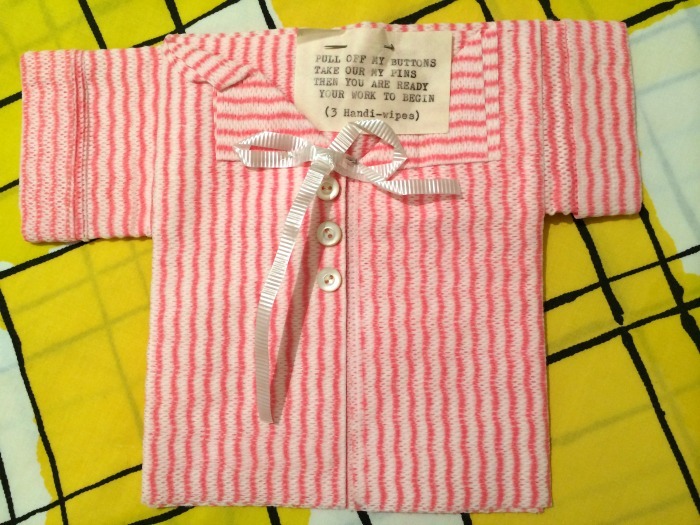 Yes, I found another little vintage shower gift outfit. Pink and white for all your dainty chores! Just this week I put two and three together and realized I really like thinking inside the box. When it comes to design I’m attracted to squares. And things in grids. Especially if they have lots of colors. You can find boxy grids all through the house, starting just inside the front door. 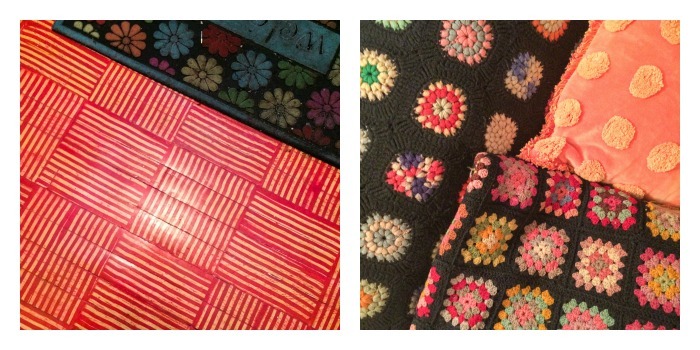 I comb-painted the foyer floor in raspberry and white squares a long time ago. I’ve got granny square afghans galore in the living room in the winter–one for everyone, and then some. Lots of chenille-dotted pillows, too. 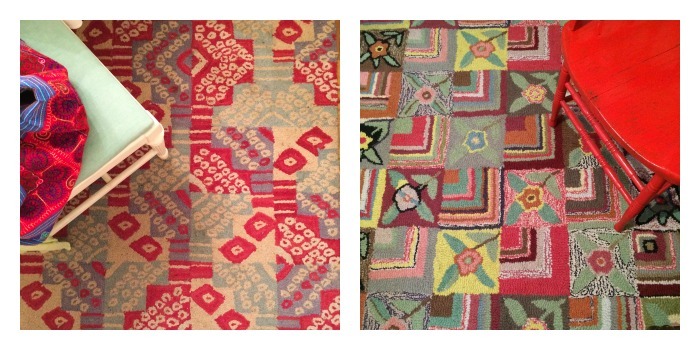 Two of my hooked wool rugs are designed on squares. 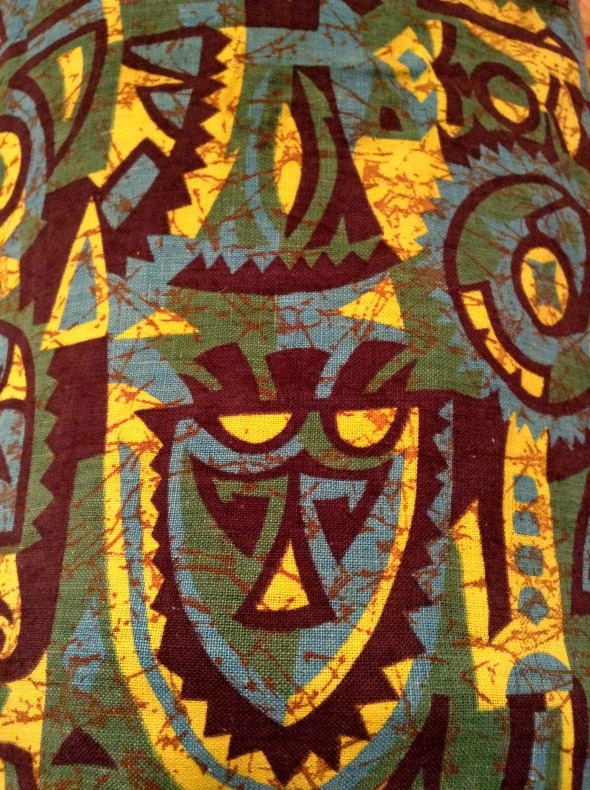 Dining room rug (with jadeite green!) on the left, sewing room rug on the right. You know yard sale season has arrived when the shelves of thrift stores start getting a bit empty. Last Saturday all the glassware was clear, all the dishes were boring, and even my favorite store with its perpetual Saturday-40%-off-bric-a-brac sale was a dud. Total dud. How is that even possible? So I hit all the off-the-beaten-track stores run by hospitals, nonprofits and nuns. 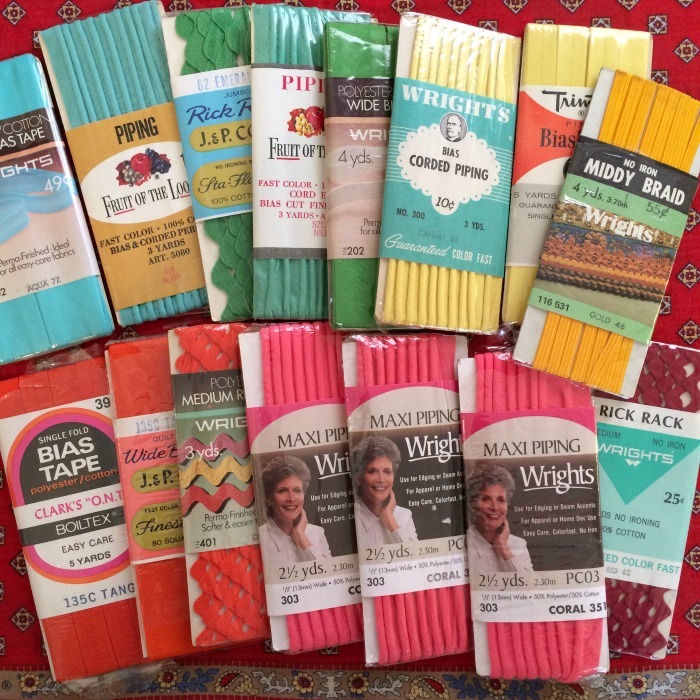 They’re the only local stores that carry old sewing stuff–fabric, notions, patterns. That’s where I found an assortment of little goodies. A rainbow of vintage trims. Fancy some pink piping on a pillow? Kelly rick rack on an apron? So many possibilities! At this stop the woman at the checkout in front of me had three laundry baskets full of toys. Expensive toys. The nun asked if she ran a day care. Nope. She was buying them all for her cockatoo! I wanted to see her house so bad. Can’t you just imagine mountains of plastic stuff with a bored bird perched on top?